In the aftermath of Canelo Alvarez defeating Gennady Golovkin by a razor thin margin on Saturday night chatter has been blowing up from social media to the water cooler. Everyone has an opinion and although I respect the thoughts of most of the fans and pundits there comes a time when I need to get to the bottom of things and speak to an expert. 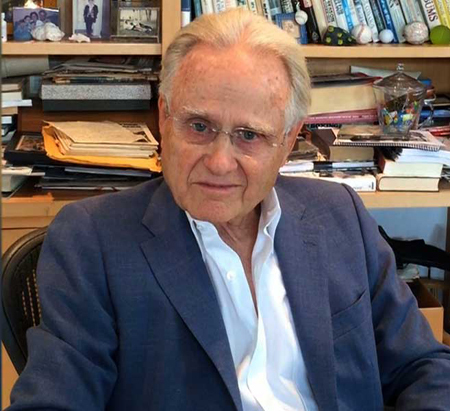 Enter Larry Merchant. If there has been one voice of reason in boxing for me it has always been the commentary Merchant offers. In the wake of yet another controversial Canelo/GGG affair I was thrilled to be able to reach out to Larry to hear him breakdown the rematch. Pound4Pound: Hello Larry, I’m going to assume you are just getting back from a weekend in Las Vegas. Larry Merchant: I got back yesterday afternoon after a really good weekend and an outstanding fight. P4P: The last time we spoke the Canelo drug test controversy had reared its head but you expected things to get worked out and a fight in September would take place. We saw that come to fruition this weekend. You also said back then that you were really looking forward to round 13. Apparently you were not let down at all. LM: No, I wasn’t let down. I think it was great fight. I don’t think there was any seconds when one of them wasn’t going after the other. And there were many seconds when both were going after each other. P4P: In regard to the torrid pace of the fight and the tactical strategies of both sides, and considering both men predicted a KO, were you surprised that the fight went the distance? LM: I wasn’t sure what I was expecting. Neither man showed they could put that kind of hurt on each other in the first fight. I think the main thing is that they were both highly motivated. Whether it was because of the first fight and its aftermath I think that Canelo was inspired in the way that this could redeem him for both what had happened earlier during the drug test and because so much has been expected of him since he was a teenager. I think he showed that the fans who spotted him early and thought he could be the next great Mexican warrior finally have it. For those who were skeptical, I get it. He was a star outside the ring before he was a star inside the ring, sometimes that happens. Some performers just have that certain personality and charisma and body language that puts them out there. Those that hung in there with him are happy and those who were skeptical might have been turned around. P4P: Were you OK with the final outcome of the fight? LM: Yes I was. A draw again would have been perfectly acceptable in terms of what went on in the ring, but I thought in the end that Canelo was rewarded for his very excellent body punching. And once again Golovkin did not do much damage to the body. Golovkin was just unable to beat Canelo down to the body. I thought the difference in the body punching was the slight difference in the fight. P4P: Abel stated after the fight they did plan on working the body but once the fight started that changed. What was it do you think that had Golovkin abandon the body attack? LM: Well he landed only 8 punches to the body in the first fight. I just think that Canelo had an advantage in his quickness as a counterpuncher and that discourages a guy from going to the body. And Canelo, given his background as a Mexican fighter, going to the body is a priority. That’s something he probably has worked on since he has been in the gym with his brothers from the age of 3 years old. When Canelo went to the body it was with authority and crispness. It was all a part of his varied attack. P4P: I had jotted down in my notes around round 5 and 6 that Gennady seemed to be laboring. I wondered to myself if maybe he had over-trained and left the fight in the gym, or worst case scenario, he was getting old before our eyes. Do you see any validity to any of those thoughts at all? LM: Well I do think once he did seem to be out of air, but to his credit he did have another gear and he came back and fought as hard as he could. The intensity was reflection of how hard they trained and the fact that they both could go at that pace for 12 rounds is something we don’t often see. If we have all exalted Golovkin for being one of the best of the best middleweights, which I agree with, then we have to give him credit for his effort and be reminded that Canelo is a world class and top class prize fighter. P4P: Before the fight Golovkin was begging Canelo to stand in front of him and fight and if he did he would KO Canelo. A lot was made of Canelo “running” in the first fight. Judges are human and if they were privy to Golvokins request do you think it may have swayed them a bit once Canelo did stand in front of him and Golvkin could not produce the KO? P4P: Are you ready for round 25? LM: No I am not. P4P: Do you think we should get a round 25? LM: I think they should go out and fight a fight or two. There are some good fighters in the middleweight division. The can both make a lot of money relative to their earning power. And then in a year or so, if they are still the class of the division and the fans want to see it again…then okay. I don’t particularly want to see it in their next fight. I have seen them fight, and I know it’s going to be a good close fight, but I want to see them fight someone else. P4P: I couldn’t agree with you more. I mentioned that myself. Shoot, the promoters have it set up perfectly. One of you fight Munguia and the other fight Lemieux. Draw straws and let the chips fall where they may and let the winners square off next Cinco De Mayo, no matter who that is. LM: Yes, but you and I and everyone else knows that Canelo can now call all the shots. He generates the most interest, the most money. If Lemieux has the choice of who he is going to fight we know who he is going to fight, especially since they are both Golden Boy fighters. There are a few others around, Danny Jacobs for instance. Why wouldn’t we want to see a rematch of Jacobs vs. Golovkin? Jermall Charlo is another name out there. It’s not like there are not challengers out there who can make a case for themselves. As Merchant stated in closing, “It was a good weekend for the old gang”. Hopefully boxing will take note of this past weekend and capitalize on a chock full 160 pound division. They sky is the limit right now in the Middleweight division. Hopefully the powers that be will use this as a springboard for fights at 160 pounds that will harken back to the days of old. This entry was posted on Tuesday, September 18th, 2018 at 4:59 am	and is filed under Boxing. You can follow any responses to this entry through the RSS 2.0 feed. Both comments and pings are currently closed.